If you’re expecting some sort of Halloween episode, then sorry. Instead you’re getting an episode about soccer. It’s also a Kouichiro focus episode, which is actually pretty nice. Nezirezia’s plan is pretty cool this week, as is the Monster of the week as well. Gotta admit, it’s not an animal I thought I’d see in a Sentai show. Apparently, from what I can find, it’s only been done twice before (in Goggle V and Dynaman). And since Mega, they’ve never used that animal again. Most of this episode centers on Kouichiro and his little brother, Shinji. It’s a nice bit of character building for both of them. All in all, this is a fun episodes. Enjoy it! Just because Zubat is done doesn’t mean we can take a break! This week, Kenta falls in love (again)! There’s also a slew of new stuff! New OP, New Battle Rizer upgrade, New weapon for Yugande, New Nezire Monster, and more Mega Voyager action! Even Mega Silver shows up! It’s a pretty jam packed episode. Anytime Kenta gets the spotlight you know there’s gonna be some laughs, especially if Shougo is around to mess with him. Enjoy this week’s offerings! Mega will be back next week as usual. We’ve finally reached the end of Ken’s journey, and what a way to end it. 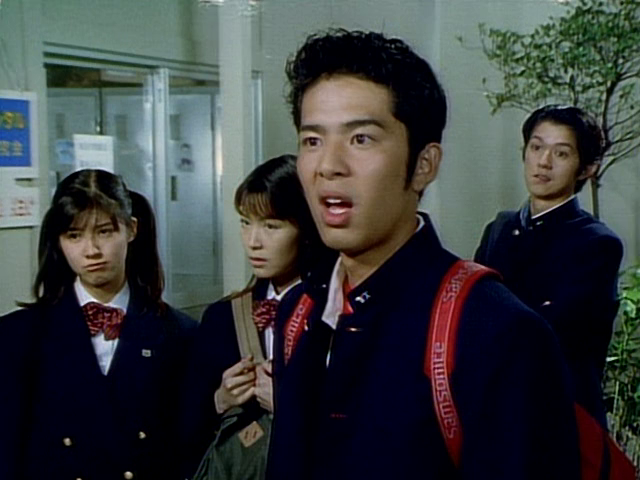 Yabuki Jiro (Taki from Kamen Rider) joins the cast this week so be on the lookout for him. Strangely, the credits say that Isao Sasaki is in episode 31 as a detective, but we can’t find a trace of him. We suspect whatever scene he was in was, unfortunately, cut. With Zubat I’ve often found myself unable to write a decent blog entry about it. It’s such a unique show that speaks for itself and I think that anything I could tell you about the episode would spoil the fun. One of the neat things about this show is that you never know what’s going to happen. Sure, there’s a standard formula they follow, but you never know what Ken is going to be best at, or how he’s going to one-up the bad guys. Every episode is a mini adventure full of laughs and suspense. I really liked how Zubat could be incredibly silly one moment, and then incredibly dark the next. Yet it wasn’t jarring. And as incompetent as Dakkar was, I never thought they were any less of a threat. They just happened to be second best. It’s been a real treat to work on this show and I hope you enjoyed it as much as I did. From the very first episode, I fell in love with Zubat and its amazing combination of surreality and charm. It may not always be the best show in the conventional sense — all tightly interwoven plotlines and carefully crafted characters — but there’s still something magical about it. It overflows with spirit and wild ideas in a way only 70s tokusatsu can. Not many shows can pit a superhero against everyday human beings and make you root for the hero. Not many shows can create a hero so convincing in his vulnerability despite his being nominally invincible and diegetically the best at everything in the world. That’s the magic of Zubat, and it’s my pleasure to have played a part in spreading that magic to everyone here. I hope you enjoy it to the very end. I’d like to say I had a deep, emotional connection to Zubat that lead to my interest in the series, but the truth is that I just think Hiroshi Miyauchi is the best. 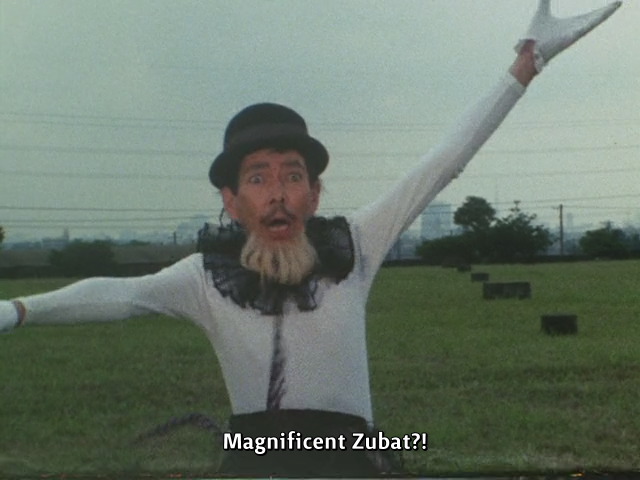 Zubat has long been considered Miyauchi’s greatest role, and after I finished seeing the show, I felt like I could really see why. Hopefully you guys can, too. Zubat and Ken, two sides of the same coin and yet still inseparable figures in their own right. Whether battling against the minor henchmen of Dakkar or that week’s hired gun, both Ken and Zubat shined magnificently. The show had amusing bad guys, clever Characters of the Week, two spunky tagalongs who followed Ken’s journey, along with a trusted friend in Tojo. But Ken was the one who brought everyone a bit of joy with his cocky, yet well-played grin as he searched the countryside for his friend Asuka’s killer. Did Zubat play to your expectations just as Ken played his guitar in every episode? Was this the greatest attempt to bring you Zubat in his 32 glorious scene-stealing stories? While I can only admit to a small part in MFC’s subbing of Zubat, I am not the second-best. (or possibly even the third-best) Those honors go to Kou, Megan and Lynx for starting down the path of burning winds with Zubat and inviting me along for the ride. To them, I give thanks and to you, the viewer who traveled with us along this grand journey, I thank as well. While Ken and Zubat’s journey may be over, we hope you truly enjoyed the experiences along with him. We’re in the homestretch! These two episodes are the last “normal” episodes before the show wraps up. But they’re just what you’ve come to expect from this show. Episode 29 features either the bravest, or stupidest child of the week (depending on how you look at it), and a villain who looks like he stepped right out of an anime. Episode 30 changes things up a little but, and it’s a really good episode. The villain of the week is hilarious as well. Anytime he’s on screen just focus on him. He really adds some much needed laughter to the episode because the rest of it is rather serious, even for this show. Next week, Haykawa’s journey comes to a close. Will he find Asuka’s killer? Will he deliver justice and get his long sought after revenge? You’re gonna have to wait to find out. I highly recommend you watch these two episodes both back to back like a movie for maximum enjoyment. There’s some amazing set pieces and model work here that is just mind blowing. 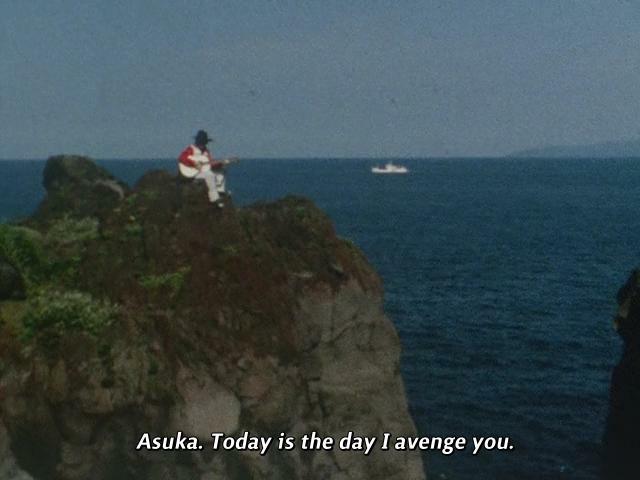 It’s one of those things that just reminds why I love Tokusatsu so much. 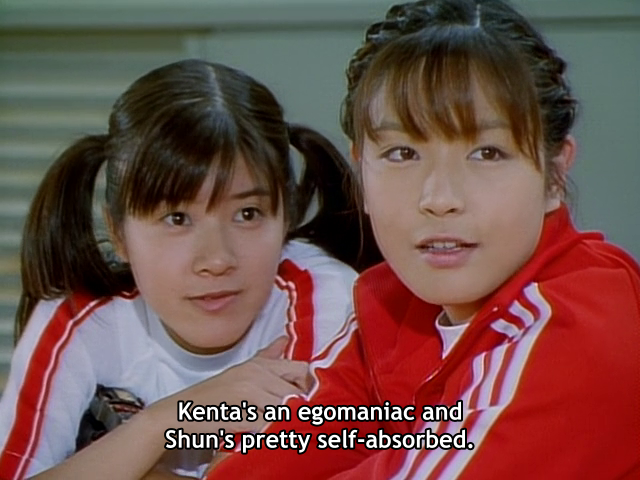 And I am dead serious when I say these are some of the best episodes of a Sentai series I have ever seen. If these two aren’t #1 then they are incredibly close. They’re wicked good. Sorry for being so late! Half the team was busy playing Pokemon (I played for 4 hours and 40 minutes straight on Satursay. I don’t have an addiction!). Anyways, these two episodes are really, really good but for this post I want to specifically focus on 28. 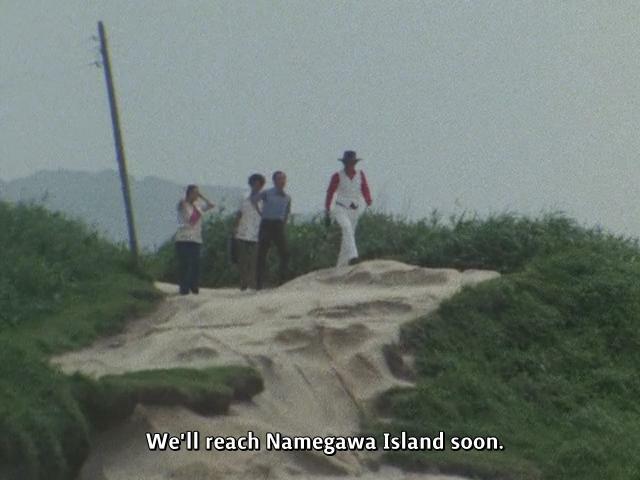 Part of episode 28 takes place on Namegawa Island. Fans of Zyuranger might recognize this place from episode 36 where Geki and the gang spent an episode helping some kid find a pirate treasure. Namegawa Island was a real life theme park/zoo that sadly closed down in 2001. Unlike that episode of Zyuranger, we don’t get to see too much of it in Zubat. It’s mentioned, and shown a bit but that’s about it. We do, however, get a very impressive shot of Zubat up on this tower on the island. I can’t imagine being up on that thing wearing the full Zubat suit. It is certainly one impressive stunt. Namegawa really had some beautiful scenery and I can see why Toei would film there. In fact, in 2004 they filmed part of the Kamen Rider Blade movie there. Even after being abandoned, it’s still a beautiful place. Zubat will be back in a few days, since these were technically last week’s episodes. Enjoy! This week, Shun gets amnesia! Girell does… Girell things! And Yugande is kinda lame (Sorry Capt. Bright). This is a pretty great episode about team bonds, and not just for our heroes. When I watched this I really got the sense that the main group of Nezirezia are like a family. They all seem to care about each other, with the exception of Girell but who likes him? Pay attention to Shiborena and Hinelar’s reactions to Girell’s actions in this episode and you’ll see what I mean. Now I’m gonna turn things over to our editor, Alkaid. She’s got a few things to say about this episode because I’m too full of Pokemon hype to write up a proper post. Teamwork is a pretty prominent theme in Megaranger. It’s how 5 high-school kids (and a researcher desperate to not have to work) fight the forces of Nezirezia. And this episode explores 2 very different teams trying 2 very different forms of teamwork. (Want to guess which one is probably going to backfire horribly?) This episode acts as a stealth kickstart back into the plot as well, as Nezirezia deals with the fact that, guess what…it’s been 30 episodes and they’ve not gotten very far into that whole ‘conquering Earth’ thing. 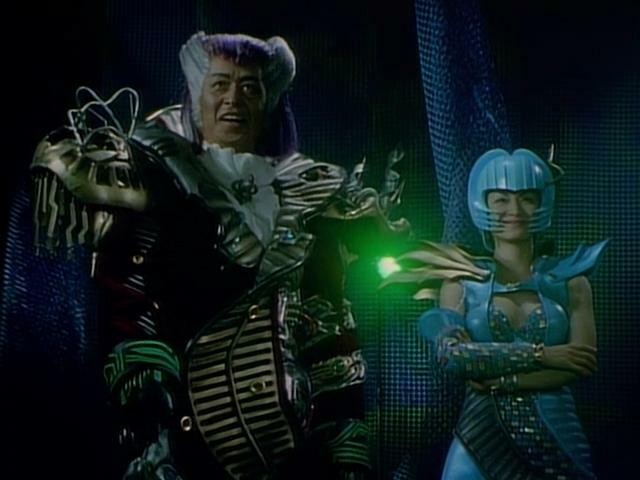 How will Megaranger fight back when Nezirezia decides to strike with a vengeance? And how will they survive when the team can’t fight back? Tune in to find out!